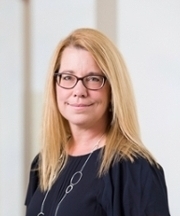 As dean of graduate studies, Melissa Sturge-Apple oversees the administration of over 40 master and doctoral programs across Arts, Sciences and Engineering and provides cohesion so that graduate students have a strong connection to AS&E. Towards this, Sturge-Apple works with faculty and students to enhance the educational experience and strong disciplinary foundations for graduate training at Rochester. She seeks to develop new and innovative programs of study for graduate students, and to also diversify the graduate student body and academia through recruitment and retention efforts. A University alumnus, Sturge-Apple received her bachelor’s degree in psychology and economics in 1992. She earned a master’s degree in counseling and human development from Harvard University, and master’s and PhD degrees in developmental psychology from the University of Notre Dame. Sturge-Apple returned to Rochester in 2006 as a research associate at the University-affiliated Mt. Hope Family Center, which provides evidence-based intervention and prevention services to at-risk children and families in the Rochester community. In 2009 she joined the psychology department as an assistant professor and served as the Wilmot Assistant Professor in Social Sciences, 2013-2015. In 2015 she was promoted to an associate professor. An accomplished scholar, Sturge-Apple’s research examines how family relationships impact child development with an emphasis on children’s neurobiological and psychological functioning, and the relationships between parental conflict, parenting and children’s functioning, and how patterns of relationships in families change through time. She also co-directs the University’s Rochester Center for Research on Children and Families, which seeks to better understand how children adjust to family challenges and relationship processes.